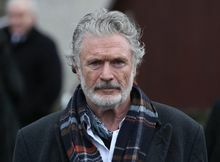 Patrick Bergin is a 65-year-old Irish actor who is perhaps best known for his role as Julia Roberts’ menacing husband in 1991’s Sleeping with the Enemy. Bergin was born in Drimnagh, Dublin in 1951 and turned to acting after living and working in London as a teacher, builder, and as part of a theatre group which he himself founded. The Irish actor has starred in a number of Hollywood films spanning a career of over 30 years. Films such as Highway to Hell, Frankenstein, Ella Enchanted and ahem, Lawnmowerman 2: Beyond Cyberspace. He also played terrorist Kevin O’Donnell in Patriot Games alongside Hollywood stars Harrison Ford and Sean Bean. Bergin fronts his own band called Patrick Bergin and the Pouts.